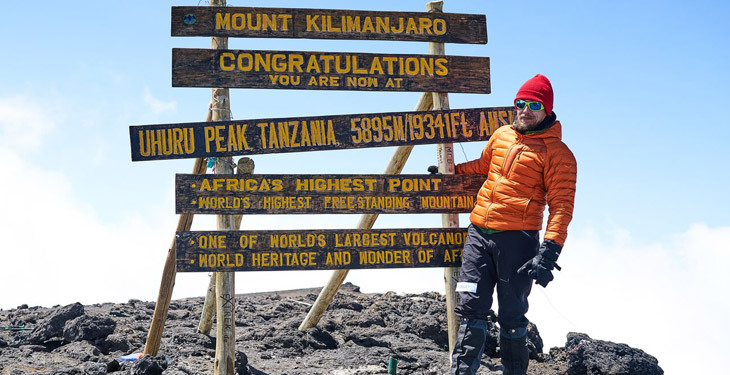 Summit the world's highest freestanding mountain via the Machame route. Trek through all climate zones including tropical forest, heather and moorland, highland desert, and the summit zone to reach Uhuru Peak. Machame, also known as the Whiskey Route, is one of the most popular climbs on Kilimanjaro. Though experienced climbers with prior high-altitude acclimatization would excel on this trek, the novices and amateurs should not be intimidated – seven days on the mountain are sufficient for getting good acclimatization for an ordinary person with no mountaineering experience. 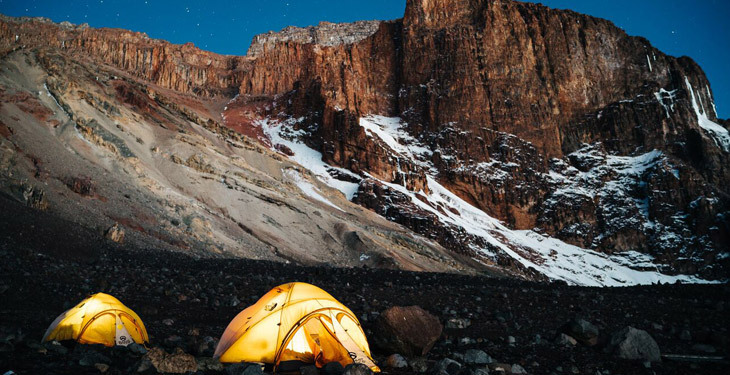 The climbing groups have a unique opportunity to enjoy picturesque landscapes, breathtaking views, and the unparalleled, pristine flora and fauna of Mount Kilimanjaro. Starting in Machame Gate at 5,400 feet, the trail goes through all the climate zones of Kilimanjaro, providing you with a good, steady acclimatization. It is important to note that some parts of this route can be quite steep. If you are planning to climb in the rainy season (November, April, and May), the path can be eroded on Machame, which will make your hike more challenging. For each two climbers a personal Kilimanjaro guide will be assigned. He will monitor your progress, help you to choose the best pace, and help you if any issues arise. All equipment, luggage, and supplies are carried by the team of porters. This allows you to fully immerse yourself in the climb and focus on summiting Uhuru Peak, the highest point in all of Africa! Arrive at Kilimanjaro International Airport, where a driver will be waiting for you. The group will go to the hotel, which has everything you need for a comfortable stay: cozy rooms, hot water, doting staff, swimming pool, and reliable Wi-Fi connection. You'll have a briefing with the mountaineering experts in the evening and the managers will answer your final questions and check the equipment. You'll also have the opportunity to rent any necessary equipment that you could not bring with you. The guides and climbing crew will arrive at the hotel early in the morning. 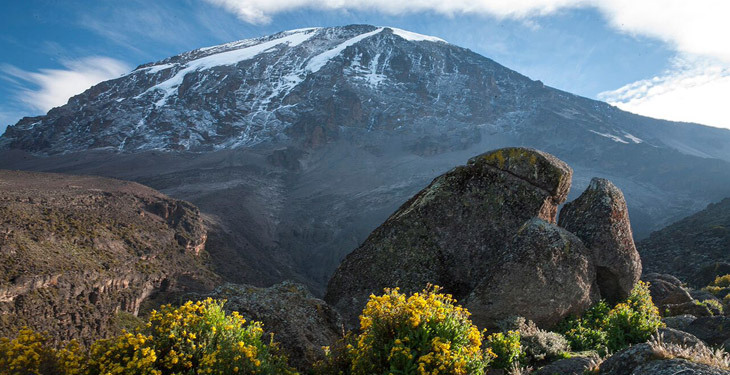 Once the guides are introduced to the team, you'll make your way to the Machame Gate (5,900 ft). Upon arrival, the guides will handle the small entrance formalities, and the group will enter the park. Along the trail from the gate to Machame Camp (9,875 ft) you'll pass through the tropical forest, where rain is frequent. •	Take Diamox pills to help alleviate altitude sickness symptoms. The pills are taken in the morning and reduce altitude discomfort. However, it is strongly advised that you consult with your GP to check possible allergic reactions. At night you may experience discomfort associated with acclimatization to the high altitude. Due to a reduction in your breathing pattern, your body gets less oxygen than during the day and you may therefore start feeling sick and have a headache. Pay attention to your body and tell your guide if you start feeling any symptoms of altitude sickness. After breakfast, the group will start trekking up to the second high-altitude camp – Shira Camp (12,615 ft). The rainforest zone ends on this day, and the group will be able to see the stunning views on the Shira Plateau. This leg of your journey is not especially challenging physically, however, high altitude may pose certain complications. Thus, choosing an appropriate trekking pace is very important. 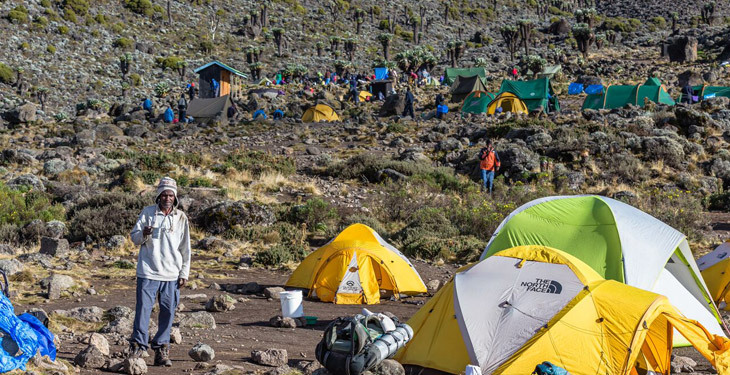 After reaching the camp and having lunch, the group will make a small acclimatization hike to the Lava Tower, gaining 985 feet in altitude, and then return to the Shira Camp, where a hot lunch will be served. Note: The acclimatization hike is a short trek with a slight gain in altitude. It helps to speed up the process of acclimatization. The importance of these hikes should not be underestimated. After breakfast, the group will start the trek from Shira Camp (12,615 ft) to Lava Tower (15,190 ft). This leg of the journey has many highs and lows. 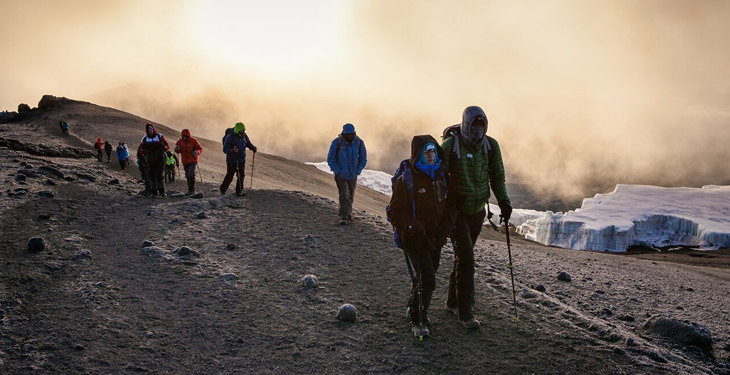 The group will reach a point just over 15,000 feet, getting good acclimatization. Then the group will trek to the Barranco Camp (12,992 ft). From this camp, you'll see the formidable Barranco Wall. Note: If one or more members of the crew are unwell, instead of going through Lava Tower, the group may go the porters' route instead. Under this option, the maximum altitude on the 4th day is only 13,200 feet. Wake up early this morning, have breakfast and then begin conquering the Barranco Wall. It is recommended to leave the camp as early as possible to avoid crowding with the other groups. 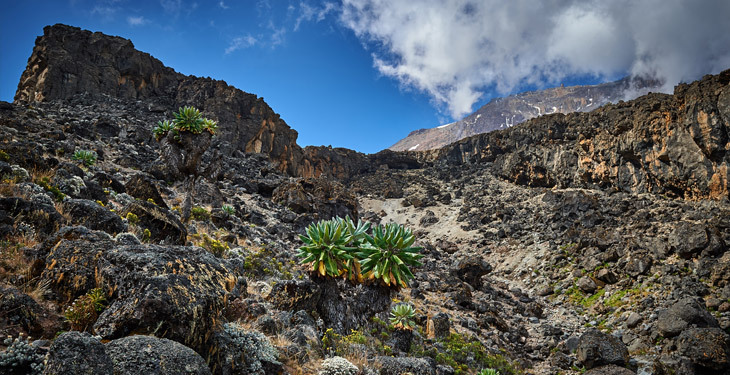 Although it may seem intimidating, hiking up through the Barranco Wall is not in fact physically challenging and the top of the wall is a good place for taking panoramic photos. You'll then make your way to Karanga Camp, followed by a small acclimatization hike on the way to Barafu Camp (some 700 ft increase). Today you'll start trekking to the Barafu Summit Camp (15,223 ft) early in the morning. This camp is a starting point for summiting. The crew will have arrived at the camp before you, making the necessary camp arrangements, preparing sleeping bags, and cooking dinner. After a small rest, the group will make an acclimatization hike to the Kosovo Summit Camp (15,748 ft) and then return to the Barafu Camp. A hot lunch will be awaiting there. It is highly recommended to spend the rest of the day resting. Tonight the group will be summiting. The group will leave Barafu Camp (15,223 ft) at midnight and start trekking to Uhuru Peak (19,340 ft). Trekking there is not demanding physically, but high altitude should be taken into account. For each couple of climbers, a personal guide will be assigned. After the group reaches Uhuru, it will be possible to visit the glacier. After that, the group will return to the Barafu Camp. After a 2-hour rest you'll start trekking down to Millennium Camp (12,533 ft), located in the tropical rainforest. Note: Do not forget that 90% of all accidents occur during the descent, including all broken arms and legs. Please pay attention to your feet, as there is a high risk of damaging your toenails. After a warm breakfast, the group will start heading for the exit of Kilimanjaro National Park – Mweka Gate (5,413 ft). A car will be waiting for you there and you'll be transferred to Aishi Machame Hotel or Altezza Lodge, where the guides and the tour managers will congratulate you and give you an official certificate from Kilimanjaro National Park. Enjoy some well deserved rest and relaxation in the hotel before transferring to the airport for your flight departure home. Headquartered in the foothills of majestic Mount Kilimanjaro, Altezza Travel is committed to organizing safe, comfortable, and enjoyable trekking adventures and wildlife safaris. The fusion of personalized customer care, rich expertise, profound experience, and modern vision constitute the foundation of their vision. Each adventure with Altezza is crafted individually. From your first email to the final goodbye, you'll receive personalized customer service. Altezza employs highly trained and experienced guides, uses modern, well-maintained equipment, and partners with reliable local businesses to provide lodging and other services, ensuring your trip is enjoyable, safe, and exceeds every expectation. The team is made up of real professionals. Assets of exceptional quality: vehicles, outfit and equipment, and hotel. Very competent guides. Altezza is a full-stack tour boutique. We have been planning our Kilimanjaro climb and safari in Tanzania for six months. Yet, however meticulous the planning may be, there are often unforeseen circumstances and a plethora of different issues… I want to emphasize the high expertise and patience of the team members. Incredible service from start to finish on our Kili adventure. My daughter and I did a 6-day climb along the Machame route with Altezza, and it was just an incredible experience. I cannot say enough good things about our crew and all of the hospitality they showed us along the trek, and we would have never summited without the help of Haji and Tumaini. The food was delectable, and the care and attention to detail blew my mind (they gave us a teddy bear hot water bottle each evening and sent me a bday cake at 4,600m!) Anna and Radhia went above and beyond to make us welcome back at the hotel. Overall, I would highly recommend. We climbed Kilimanjaro with Altezza Travel and everything was very well organized from the very beginning! They picked us up at the Kilimanjaro airport, the car was very comfortable, and they drove us to the hotel. We had a briefing about our climb, so we knew what to expect. Our guides Moses and Rama and porters were absolutely amazing! They did a great job. They made sure we were very well nourished while on the mountain, food was delicious and we got to the top of Kilimanjaro safe! Thank you for everything!!!! Please note there is a minimum of two participants required per departure date. 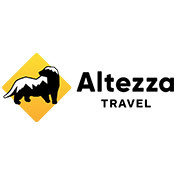 Do not make travel arrangements until you have received confirmation from Altezza Travel. Plan to arrive at Kilimanjaro International Airport (KIA), where you'll be picked up by a representative from Altezza Travel. Airport pick-up and drop-offs are included. Accommodations are provided in Aishi Machame Hotel or in Altezza Lodge. Both hotels are cozy and have everything necessary for a comfortable stay – reliable Wi-Fi (which is rare in Africa in general and in Tanzania in particular), nice rooms, swimming pools, restaurants with continental and African cuisine, and doting staff. While on the trek, Altezza will provide modern comfortable tents. Single accommodations are possible if booked in advance. The price for a single supplement is $55 USD per guest per night, payable directly to Altezza Travel. Breakfast is included before and after the climb. If you decide to extend your stay, breakfast is included with each paid night of stay. The restaurant menu features a traditional continental menu (various pizzas, spaghettis, salads, cereals, fish, chicken, and beef steaks, etc. Vegetarian menus are also available). During the trek the menu includes different soups, garnishes, several types of fish and meat, and fresh fruit and vegetables. • Tips to the climbing crew (tipping the guides and the porters is a customary practice in Tanzania; although it is not obligatory, the climbing team relies on these). Average recommended tips are $200-$250 from each guest. A packing list will be provided upon booking. Book confidently with Free Cancellations within 72 hours of booking. After 72 hours, cancellation fees will apply. Cancellations are subject to the full discretion of Altezza Travel. For more information on our Travel Cancellation Policy please Click Here.